All 86 Metrorail stations are open and ready to move Monday, two days after a record-setting snowfall forced trains into underground-only mode from 1 p.m. Saturday through Sunday. Furthermore, the Morgan Boulevard Metro station will remain open an hour later to accomodate the crowd expected to attend the Redskins game at FedEx Field in Landover, Md. 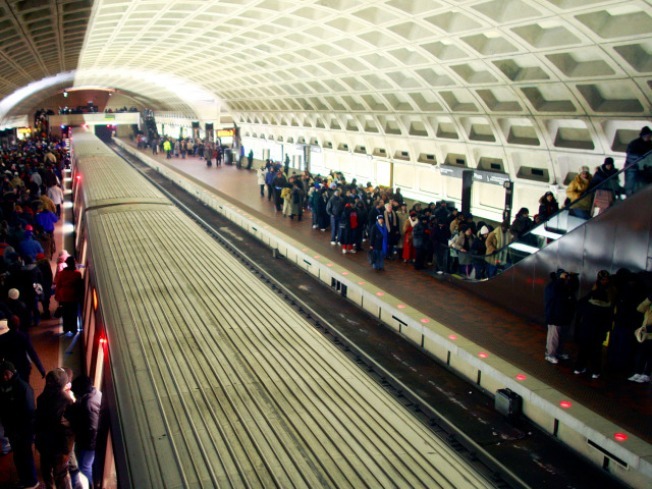 The last Blue Line train bound for Franconia-Springfield will leave Morgan Boulevard at 12:27 a.m. Additional trains will be in service at the end of the game, and in case of overtime, Metro will make sure trains are still available for fans to get home. Riders can expect delays along above ground tracks. Metrobus service has also resumed, but is likely to be running somewhat behind schedule. All but two bus routes will be operating in the District of Columbia. Buses are not yet able to maneuver in the neighborhoods served by Metrobus routes 60 and G2 in Washington. In Northern Virginia, six routes remain restricted from Metrobus service due to snow and ice—they are routes 1, 3, 7, 8, 23 and the 24T. Metrobuses will stick to snow emergency routes in Maryland to start the day. Bus service operations managers will monitor all of these areas with an eye toward returning service to those lines when road conditions improve and it is deemed safe for buses to drive along those streets. MetroAccess will be operating limited service from 8 a.m. to 5 p.m. for individuals whose trips are associated with life-sustaining medical needs such as chemotherapy and dialysis. Trips for MetroAccess customers who do not fall in that category were cancelled automatically. Metro says its employees and contractors labored from Friday night through the wee hours of Monday morning fighting the ice and unprecedented amounts of heavy snowfall. “Digging out 106 miles of tracks, our rail yards, our bus garages and our vehicles was an uphill battle from the start. I thank all of our employees who brought us through to be able return service to the region,” said Metro General Manager John Catoe. Bus riders are advised to be extra cautious when boarding and alighting buses as most bus stops are blocked by mounds of snow. The piles of snow can sometimes cause people to slip and fall under a bus.